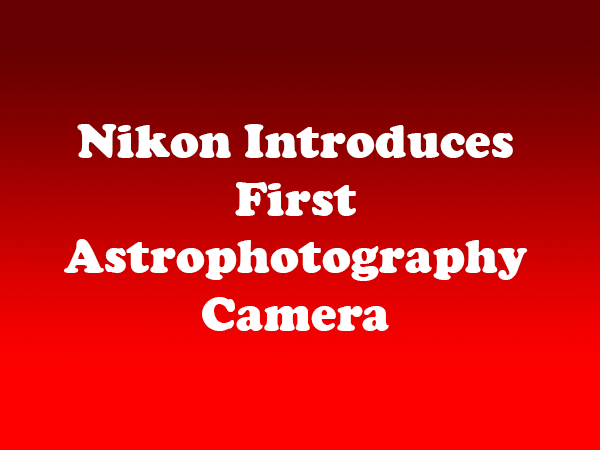 Nikon has introduced the first full-frame camera designed exclusively for astrophotography. Most cameras have broad-ranging infrared filters that filter out some visible red light. While useful in traditional applications, they make it difficult to capture the strong red H-alpha light emitted by nebulae and galaxies. The Nikon D810 features a modified infrared cut filter that allows the hydrogen alpha spectral wavelength to pass through, resulting in four times greater sensitivity of the 656nm wavelength. Long-exposure manual (M*) mode that supports shutter speeds as slow as 900 s. Users can select a shutter speed from 4 to 900 seconds. A modified viewfinder displays a virtual horizon, which is always illuminated in red when enabled, to help keep the camera level. The ISO range has been optimized from 200 to 12,800 (Hi-2 51,200), for maximum sensitivity with the optimal signal to noise ratio. A live view preview function that makes it easier to focus and compose images. It can also be enlarged up to 23x. As with the D810, Nikon’s latest camera also boasts a high effective pixel count of 36.3-million pixels and the EXPEED 4 Image processing engine. In addition, astrophotography buffs will also benefit from the electronic front-curtain shutter, which effectively suppresses internal mechanical shake. The Nikon D810A will be available in late May 2015 and will retail for $3,799.95. For more on astrophotography, including how to get started with the DSLR you already own, stay tuned to this blog.